iWindsurf Community :: View topic - Sept 8, Updated Fire map and info. Sept 8, Updated Fire map and info. From my deck in Stevenson this afternoon just watched the eagle creek fire jump several ridges within a matter of minutes. Fire appears to now be east of blackberry beach/Herman creek. Fire Update – Friday, September 8, 2017 – 10:30 a.m. Favorable weather helped minimize fire activity on the Eagle Creek Fire overnight. Relative humidity reached 100% in many areas as low clouds moved in as far as the Pacific Crest Trail on Benson Plateau above Cascade Locks. Night crews reported, however, that there was some unmeasured fire growth on the ridge above Cascade Locks. No Infrared imagery was available overnight. Today, crews will continue with structure protection and will focus efforts on the western, eastern and southern flanks of the fire. As weather allows, more burnout operations are planned to secure fire line near the Bridge of the Gods. This will bring an increase in smoky conditions, but will help in securing the fire’s edge. Fire crews will be working today to remove brush from Forest Road 2030 around the perimeter of the Bull Run watershed as a fire break to protect the drainage. Yesterday, after the smoke dispersed near the river, helicopters were able to cool down hot spots on the steep terrain near Cascade Locks. There are currently 10 helicopters assigned to the fire that will continue dropping water as weather conditions are suitable for flying. River due to debris on the roadway and the potential of rolling rocks and falling trees. The Oregon Department of Transportation will begin removing the first of at least 2,000 hazard trees today that need to be felled before the highway will be safe to re-open. 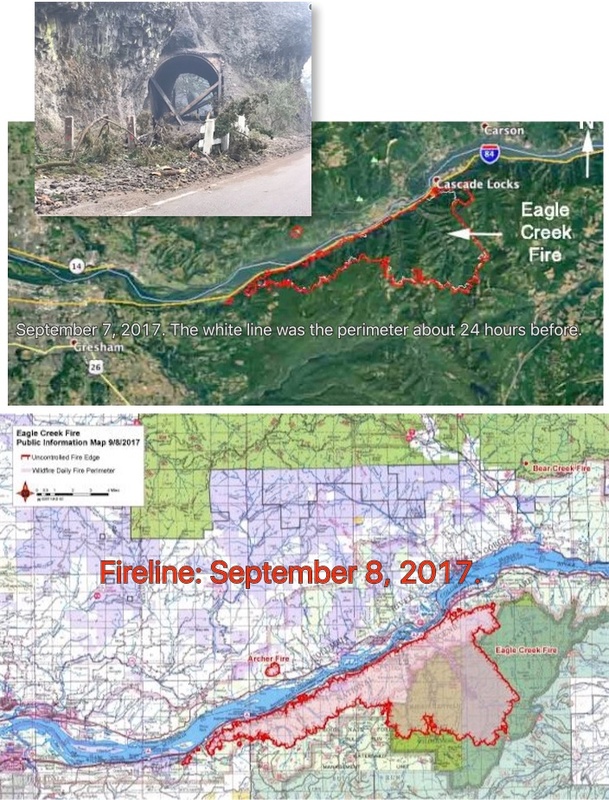 The Office of Oregon State Fire Marshal has updated the number of structures destroyed by the Eagle Creek Fire to four. One structure was a full time occupied residence. The additional three structures were non-full time residences that were unoccupied. OSFM will continue to assess the areas where the fire burned as conditions allow. A community meeting was held in Hood River last night with an estimated 615 citizens in attendance. Thousands more followed the meeting through live-stream video. For real time and current evacuation information, please contact the Multnomah, Hood River, or Skamania County Sheriff's Offices.